A metal garage from American Steel Span is affordable, beautiful and a pleasure to own. From the availability of colored endwalls and roof/sidewall panels to matching trim, these metal garages are not only sturdy, but are very attractive. The bolts that are provided with American Steel Span metal garages are corrosion resistant, extremely durable and are color coordinated to match your building. 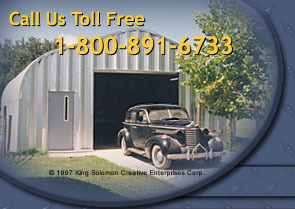 The roof/sidewall panels on every metal garage are fabricated from AZ55 Galvalume®. This provides your metal garage with a high corrosion resistance and it is made of a minimum of 23 gauge steel up to 22, 20, 18, 16 and even 14 gauge, depending on the wind and snow load of a particular area. An American Steel Span metal garage is designed to withstand the worst that Mother Nature can offer.